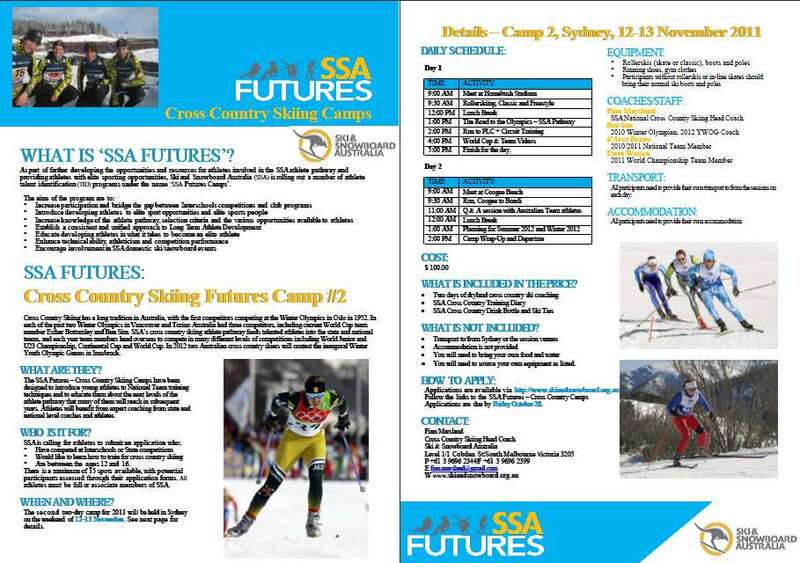 The second SSA Futures Cross Country Development Camp for this Spring will be held in Sydney on November 12/13. Aimed at athletes who compete at the interschools and state championship level, the number of participants is limited to 15. The schedule for the weekend includes rollerskiing, strength training, video and information sessions with national team athletes and coaches, and a beach run. Applications can be made online on the SSA website from tomorrow Tuesday October 25, with applications closing this Friday October 28. The 2011-2012 Cross Country Skiing National Teams have just been released by SAXC, the cross country committee for Ski & Snowboard Australia. Esther Bottomley and Callum Watson are the only two athletes named to the World Cup Team for 2011-2012, with Ewan Watson, Mark van der Ploeg and Alex Almoukov on the Continental Cup Team. 2010 Winter Olympian Bottomley will target Sprint World Cup events in January and February this coming season, while Watson’s main season goal is the World Cup Tour de Ski featuring 9 events in 11 days over the New Year period. 2010-2011 National Team and 2011 World Championship Team members Ben Sim, Chris Darlington and Nick Grimmer are stepping down from the team this year after many years on the international circuit. All three have already begun to put back into the sport in coaching capacities. A total of 24 athletes are being invited to join the World Cup Team, Continental Cup Team, National Squad and Junior Team. The full team list is available in PDF format below. Note that team selection is subject to acceptance of the team invitation by the athletes.